David Wood of Symbian Foundation has made an impressive demonstration of what "being open" means: he shows Symbian Foundation platform release plan, with comments! For the first time I'm a believer. I have always had faith in Symbian OS, but now I'm beginning to believe it might really be "open". The possibilities are... limitless! 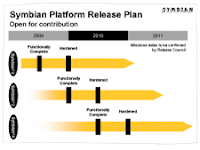 Looks like we'll see first Symbian^2 device announcements this summer. Since it's based on S60 5.1, it should be "just" a better Touch UI device. Think something like Nokia N97 (based on S60 5.0), but better, faster and more. First community effects will be seen in Symbian^3. Most likely no major features are introduced, but existing ones will start to turn into unexpected directions. Symbian^4 is something different. That is the moment of truth, showing whether Symbian Foundation has succeeded or not. Observations on mobile, technology and software development. Currency Conversion can be Fun! How Many Developers Does it Take? Maemo 5 - Still using Hildon! Nokia to become MVNO in India? Does Innovation and number of Patents correlate?